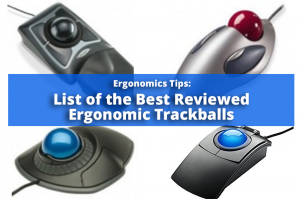 List of the Best Reviewed Ergonomic Trackballs - Solutions Northwest, Inc. The following is a list of the top trackballs our ergonomics experts recommend during ergonomic evaluations. These can all be used with PC or Mac computers. There are many other trackballs from which to choose, but these three we’ve reviewed fit ergonomic parameters and have proven to work effectively. When we review products we take into account the ergonomics of the design, quality, warranty, installation, reputation of the manufacturer, and price. We are not compensated in any way for this review and the opinions expressed are our own. Kensington Orbit Trackball with Scroll Ring, Model K72337US The Kensington Orbit fits small to medium hands. There are different versions of the Orbit. The one which we recommend has a blue ball and scroll ring. It retails for 39.99. It only comes in a wired version at this time. Kensington Expert Mouse Trackball, Wired Model K64325, Wireless Model K72359WW The Kensington Expert fits large hands. It comes in wired and wireless versions. It retails for 89.99 for the wired version and 99.99 for the wireless version. This trackball is unique in that it has 4 button instead of two. IT usually must get involved to activate the top two buttons. If using this trackball, make sure to keep the palm rest on it. Without the palm rest, wrist extension can occur. Logitech Trackman Marble, Model 910-000806 If you do not need the ability to scroll and have medium hands, the Logitech Trackman is a good choice. The page up and page down buttons on your keyboard can be used instead of scrolling. It retails for 29.99. It only comes in a wired version at this time. There are different versions of this trackball. The one we recommend has the ball in the middle. We do not recommend the thumb trackball version. Remember to always consult with your doctor to rule out any possible underlying cause of pain. Whether you decide to try a trackball mouse or not, be sure to perform an ergonomics assessment to ensure better office safety. For more guidance on all work related health and safety issues, visit your ergonomics experts at SolutionsNW.com or Contact Us for more information. Subscribe to our blog for more ergonomics tips from Solutions Northwest Inc., ergonomics consultants located in Washington State, Northern California, Oregon, Seattle, Olympia, Tacoma, and Portland.